Sugar has made its way into many staple food items, such that average Americans consume far more sugar than they realize. The U.S. Dietary Guidelines caps sugar at 10% of daily calories–which amounts to about 25 grams for 2,000 calorie/day diet, That’s still too much for people struggling to lose weight or fight other nutrition-related diseases, such as diabetes or heart disease. Of course sugar is used to make foods sweet, but ever since officials started recommending a low-fat diet, starting in 1970, food manufacturers have been adding sugar and other carbohydrates to foods to replace the fat. 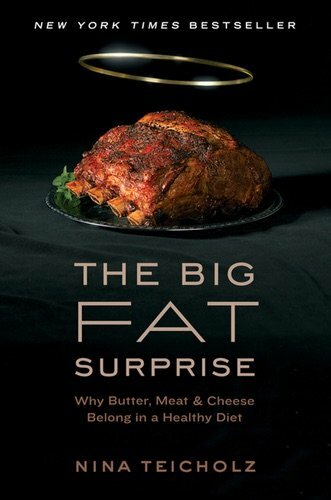 Since fat conveys both flavor and texture, removing fat from food made it relatively tasteless. Thus, for many food items, sugar was the answer. It can improve taste and enhance flavor. of foods, Fat free milk is wan and unappealing. But fat-free milk laden with chocolate and sugar tastes pretty good! Hence, as fat was engineered out of the diet, generations of Americans were weaned to the taste of extra-sweet sugary foods instead. Many of these foods contain a staggering amount of sugar in a single serving, more than an entire day’s “allowable” amount of sugar, according to the U.S. Dietary Guidelines. Sweetened applesauce, for example, has 36 grams of sugar, vastly exceeding the daily sugar limit for women and children. Meanwhile, a cup of OJ contains 21 grams of sugar. Consider, also, bread. The average slice of white bread contains around 3 grams of sugar. 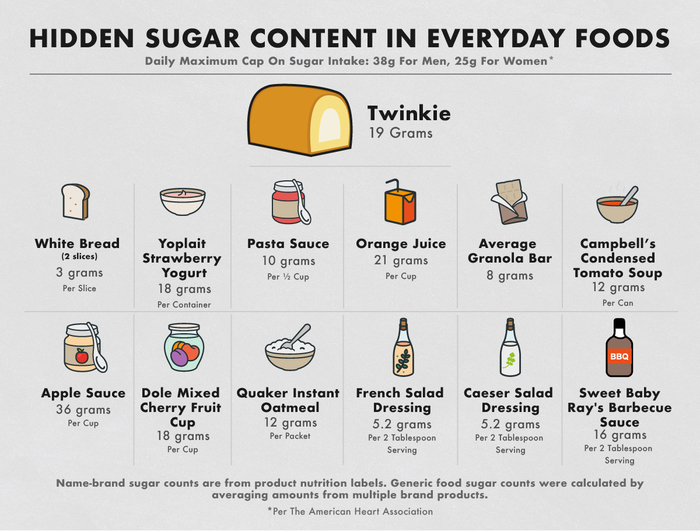 Some of this sugar content is formed naturally in the baking process, but sugar is also added for additional browning. Thus, one sandwich has a least 6 grams of sugar, and that doesn’t count the sugar found in jam and most peanut butters. Even fruit, with its natural sugars, can add up. Berries tend to have the lowest sugar content, while Dole mixed cherry fruit cup contains 18 grams per cup. What Can Be Done About Excess Sugar? Sugar, like all carbohydrates, stimulates the pancreas to produce insulin, and insulin is highly effective at storing sugar in your fat cells. Over the past few years, public health agencies have increasingly begun to warn the public about the dangers of sugar and its role in obesity and diabetes. However, sometimes those efforts send mixed messages. 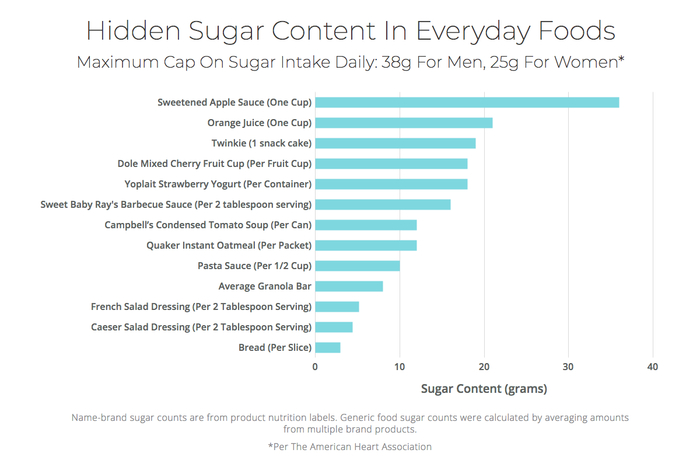 For instance, this infographic by the American Heart Association appears to warns people away from sugar while paradoxically looking like a mouth-watering invite to a old-fashioned sweet store. The “not so” warning tucked in before the swooping ”Sugar is Sweet” headline could easily be missed. And while some good points are made, such as the suggestion to drink sugar-free beverages rather than than the sweetened kind, the recommendation to “add fresh or dried fruit to oatmeal or cereal” is misguided. 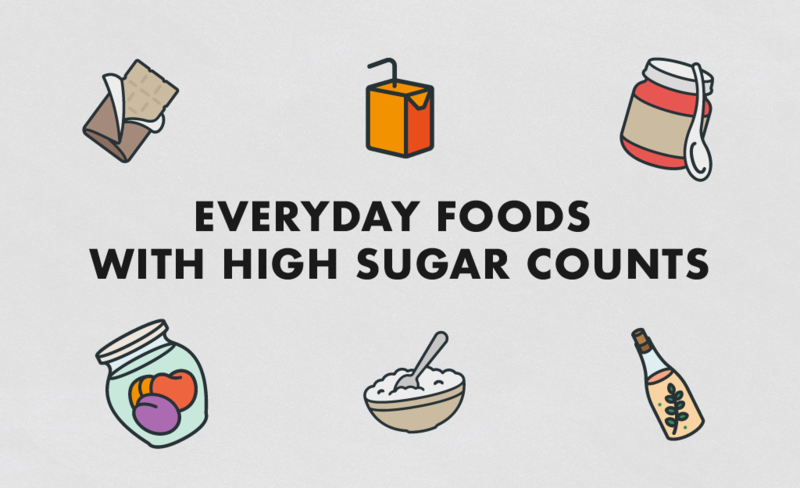 The sugars in fruit, oatmeal and cereal will spike your blood sugar just as much as “added” sugars in a soda. Your body doesn’t know the difference. Thus, if you want to combat obesity, diabetes and other metabolic diseases, it’s better to stay away from sugars altogether, added or natural. Hi, I think that this is not correct as the insulin response to natural carbs and refined ones is not the same.